A joint venture of Reliabe Equipment & Aero Visions Intl, Inc.
We are proud to offer our XeVision products for your aircraft safety. Based on the latest in lighting technology for high end European cars, High Intensity Discharge (HID) Xenon (Xe) metal halide arc discharge lamps are the ultimate 'bright' solution for your landing and taxi light requirements on your experimental and production aircraft. see also http://www.xevision.com. At less than half the wattage of standard landing lights, the light intensity increase is approx. five fold with 500'000 candle power. Life expectancy is increased 30 times. Our HID Xenon lamps - also known as Xenon HID - are the perfect replacerment for your existing landing/taxi lights as well as for your new installation. XeVision is the choice for your safety. Your next night landing will be like a day-time landing! XeVision: the perferct match of safety and performance. About us Provides information about all the aviation activities of Aero Visions International, Inc. (AVI) we've made available here for Internet WWW visitors, checkout the aviation credentials. 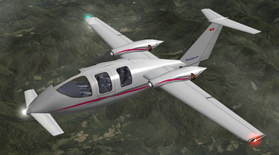 Highlights our high performance twin pusher kit plane design based on a Three Lifting Surface (TLS) concept. Provides an overview of specific consulting and builder assistance services for composite kit plane (Lancairs, Glasairs, and others) owners in the USA as well as abroad (Switzerland, Austria, Germany). High Intensity Discharge (HID) Xenon (Xe) metal halide lamps are the ultimate 'bright' solution for your landing and taxi light requirements. Credits - Support - worth looking Aviation Links - famous Search Engines - and more. Check out our unique mouse pads with the SkyShark and Red Rocks of Sedona (AZ) scenic designs and personalize these mouse pads. Aerospace-inspired motion visualization and situational awarness iOS app, which turns any Apple's iPhone and iPad models into a mobile Glass Cockpit for education and entertainment. On the iTunes App Store since Oct. 2008. iHUD has been acquired by Air Avionics (Butterfly Avionics GmbH) in June 2014 discontinued, 2016. Aerospace-inspired motion visualization and situational awarness iOS app with external AHRS, which turns any Apple's iPhone and iPad models into a mobile Glass Cockpit for pilots. On the iTunes App Store since Sep. 2011. iHUD Remote has been acquired by Air Avionics (Butterfly Avionics GmbH) in June 2014, discontinued on June 21, 2016. Copyright © 1995-2018 Real Art GmbH. All rights reserved. Privacy Notice.